The Concordia Stingers football team lost to the Sherbrooke Vert et Or, with a score of 30-13, on Sept. 30 in the 31st annual Shrine Bowl. The Stingers, who now have a 2-3 record, had to play without quarterback Trenton Miller. Miller was injured in a game against the Laval Rouge et Or on Sept. 24, which the Stingers lost 12-8. During that game, Miller was pressured out of the pocket and rushed the ball upfield. As he was carrying the ball, Laval’s Gabriel Ouellet, who came from Miller’s blind side, levelled Miller with a hard hit. The video replay shows Miller’s head snaps back, making it look like there was a hit to the head. In any other league, such as the National Collegiate Athletic Association (NCAA) in the United States, any hit to the head, or at least a hit that causes the head to snap back like that, is an automatic penalty. But in the Réseau du sport étudiant du Québec (RSEQ), the official will penalize a hit to the head only if there is clear intent to injure. Later in the game, Stingers receiver James Tyrrell was forced to leave the game after taking a vicious hit from Kevin McGee. Tyrrell was in a vulnerable position during the hit, with his two hands on the ball and his feet unstable, when McGee jumped to hit him. Tyrrell also missed the next game against the Vert et Or. 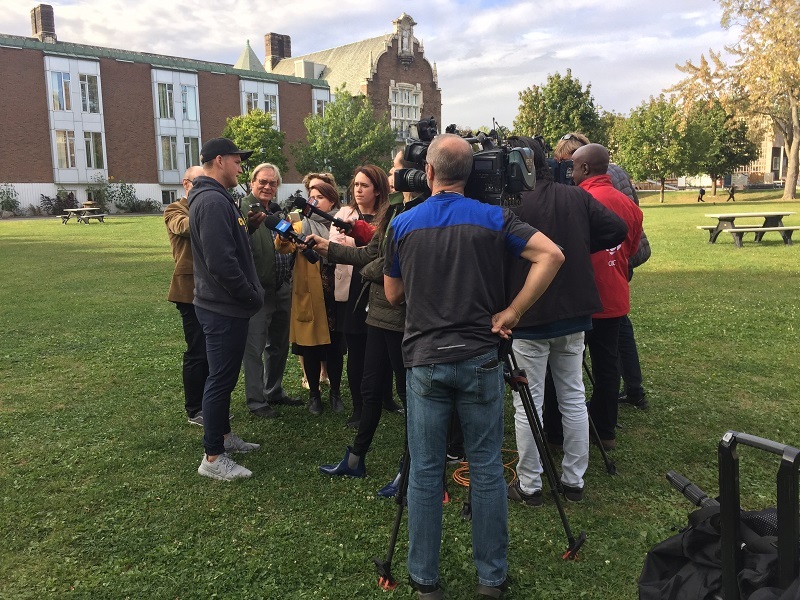 Miller made headlines after posting a video to Facebook on Sept. 26, before the RSEQ’s decision not to suspend Ouellet. He pleaded that the RSEQ review the hit he received, as well as the one Tyrrell was involved in. The video has been viewed over 66,000 times. “What really pains me is that my parents shouldn’t have to watch my game and worry about me dying on the football field as a result of these head-to-head collisions,” Miller said in the video. On Sept. 29, the RSEQ issued a response, stating they reviewed both hits. They suspended McGee, who hit Tyrrell, for one game for unnecessary roughness. The hit on Miller, however, was deemed by the league to have not made contact with Miller’s head and, therefore, no action would be taken against Ouellet. University of Manitoba quarterback Des Catellier saw Miller’s post on Facebook, and said he does not agree with the RSEQ. “I would maybe agree that he wasn’t in a vulnerable position [as the ball carrier], but the defender led with his head, which, to me, would be intent to injure,” Catellier said in an interview with The Concordian. Miller, who spoke about the incident to the media after the league’s decision on Sept. 29, appreciated the league’s efforts in reviewing the dangerous hits. Trenton Miller scores a touchdown against the McGill Redmen during the 2015 season. Archive photo by Brianna Thicke. Stingers head coach Mickey Donovan, who called an emergency meeting with RSEQ officials on Sept. 25 to review rules regarding player safety, said he believed this week’s conversation on hits to the head could lead to some changes to the current rules. As for when Miller will return to play, he’s not in a rush. The Stingers will take on the number-one ranked Université de Montréal Carabins on the road on Oct. 5.